“Did you know you can roast green coffee beans in a popcorn popper? !” It’s summer 2006 and Dave is reading a Squidoo Lens (webpage) that talks about using a hot air popper to roast green coffee. I grin at him, figuring this will be a short-lived interest that’s probably not worth the time it’s going to take. But what the heck, right? Let’s give it a try. To be honest, I never thought about the fact that coffee comes off the plant in a state other than the roasted brown beans we were buying in the store. I mean, we love coffee and we would spend extra to get beans we thought tasted better, but I never did a lot of research into coffee, the various roasts and ways to prepare it. I just drank it and enjoyed it and went about my day. The West Bend Poppery II was recommended as a type of air popcorn popper that would work (the hot air needs to come in from side vents). We set out to scour our local thrift stores and found one fairly quickly. We bought the green (unroasted) coffee beans from an online store recommended in the Lens, Sweet Maria’s. (We still buy from them; their beans and customer service are exemplary!) Dave did all the research, although I did some light reading myself just so I would know what the heck he was doing. We found out that you can vary the roast from light to dark, and bring out different qualities in the coffee bean that way. You have to listen for a popping/cracking sound as the beans roast (there’s ‘first crack’ when they first start to turn brown, and ‘second crack’ which obviously comes later). Sweet Maria’s is really informative; they let you know what type of roast works best with the beans you’re buying, and what different notes will be brought out in the flavor of the coffee. You can’t get too fancy with an unaltered popcorn popper, as far as regulating temperature and such, but it really does work! We would go outside on the deck and crouch next to the popper, listening as hard as we could for the cracking sound. (Not an easy task for two hearing impaired people, listening over the loud noise the popcorn popper made as the beans whirled around inside.) But we figured it out, and Dave finessed it, learning to tell by color and smell, as well as the cracking sounds, when the coffee was done to the point that we liked it. I was very wrong, by the way. He never gave up his interest in roasting his own coffee beans, and for his birthday at the end of October that year, I got him a very basic coffee roaster as a gift. He got an upgrade the following year. Since then, he’s made his own huge roaster with a rotisserie oven that we found at a thrift store; he modified it, added a second heat source, and now he can roast a much larger amount of coffee at one time. He also started playing around with methods of making coffee. 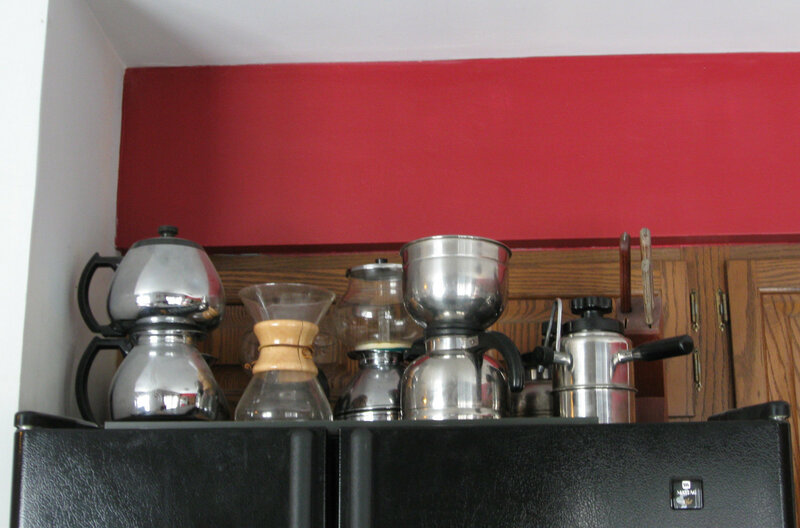 We had a Bunn that brewed into a thermal carafe, and that was our favorite coffee brewer at the time. After playing with a few things (Chemex pour-over, French press, moka pot and vacuum pot) we decided we liked the flavor from the vacuum pot the best. It was cool to watch (our original one was a glass Cory so we could watch the action) – you put the water in the bottom pot and heat it up, add the ground coffee to the top section, and when it reaches the right temperature vapor pressure causes the water to get sucked up into the top. (The top chamber maintains the temperature at 190 degrees.) You let the water and coffee mix together on top for about four minutes, then turn down the heat and the water gets sucked back down into the bottom. There’s a filter that prevents the grounds from being sucked back down, so your bottom pot has your delicious coffee. It makes a really clean, smooth cup of coffee – I like it better than a French press, which lets more sediment through. This was another thing I didn’t think we’d keep doing – it’s a little more work than a coffee brewer, after all – but here it is, 2013, and this is the only way we make our coffee. We even bring the vac pot with us if we’re going on vacation – we have a stainless steel Nicro that we use every day, on the gas stove, and an electric Sunbeam that we can bring with and use anywhere there’s an electrical outlet. It also saves us money (green beans are cheaper than the roasted ones in the store) and since we roast on an as-needed basis, the coffee is always fresh. I have to confess, if Dave didn’t do this I would be a little lost since I no longer participate in the roasting process, but I’m happy to reap the rewards for as long as he’s interested in roasting our own coffee! The coffee thing kicked off a little ‘what else can we do from scratch?’ thing with us, and I have to tell you, we get such a kick out of it. It suits our personalities and it’s something we enjoy doing together. Actually, the one thing I remember Dave doing, even before the coffee roasting, was making homemade applesauce. This was another thing I just never even dreamed of making – to me, applesauce came from a jar you bought at the store. I was intrigued when Dave said he was going to make applesauce from the apples we’d picked in Michigan. I love applesauce, but I found out that day that I’d never really tasted applesauce the way it could be. And the kids. The kids were absolutely gobsmacked the first time they tasted Dave’s applesauce. Even now, they get excited when they find out he’s planning to make it – it is so freaking good, and not hard to do. Over the years, we’ve had lots of fun figuring out which things and worth it to make from scratch. We always make our own bread, biscuits, pie crust and pizza dough, and recently we added English muffins to that list. (I wasn’t sure they’d be worth the extra time, but they really are!) We render our own leaf lard, and that gets used in place of shortening (as gross as it sounds, it’s better for you and it makes amazing pie crusts). I always make my own granola. Dave makes his own hot pepper sauce. I’ve made cream cheese – it wasn’t a total success, but it was decent and now I’m interested in trying it again and branching out into some other cheeses from scratch (ricotta, mozzarella). We do make our own pasta, but that’s not something we always make from scratch. I think it’s really time-consuming, and it’s best if you’re making linguine or fettucine. Most of the time, though, I use a tube-shaped pasta or farfalle or gemelli, so I do buy dried pasta instead. But we love the flavor of homemade pasta, and it cooks in a snap, so it’s something we make every now and then. We’ve also tried homemade tortellini and ravioli; again, a little more work than I want to do on a regular basis. But it’s nice to know that if I wanted to make a pasta dish and didn’t have any on hand, I could make some from scratch. I think that’s the nicest thing about this…it puts so many possibilities at your fingertips. Here’s to homemade!